As we approach the final hours of 2009, I can't help but think how fabulous this year has been. I married my best friend, my business found its heartbeat, I got to know a new city, I've made lots of new friends. But, most of all, I have found myself. Yes, I know I will constantly change as life progresses, but I'm finally comfortable in my own skin and for the first time in a long time, I'm incredibly excited for where my life - as a woman, as a wife, as a business owner - is headed. I feel beyond blessed to be doing what I love and actually moving forward and making it a career. I want to thank all of my interweb friends and readers for all of your support, comments and emails. I absolutely adore the photography community and I'm forever indebted to all of you that keep this blog alive. 2010 is going to bring lots of new things and I'm thrilled you all will be here for the ride! So here's to new beginnings. Here's to health and success, to love and laughter, to new friends and old friends. Here's to 2010. And because we're dorks, we documented our recent date night with our flip camera to share. I swear, we're fun. And I swear I'm not always on twitter! Date Night from Love Ala on Vimeo. I'm so excited to share this session because the Valencia family was SO much fun! After this session, and my other one with the Ayala Sisters, I'm incredibly in love with siblings-over-the-age-of-13 sessions. It's where I thrive. Pulling out each one's personality, seeing each of their individual sparks makes me love love even more. Veronica, Elizabeth, David & Katherine wanted to give their parents some update photos for Christmas. They showed up to The Orcutt Ranch in style, hair & makeup done By Lauren, with energy that I wish came in a bottle. Their smiles are so infectious that I think I smiled the entire time too. Here are some of my favorites. Steven: Why are there crumbs in our bed? Ala: Um, I may have eaten some popcorn while watching Roseanne. Steven: Okay, so, why is there a chocolate smudge on your pillow? Ala: Fine! I also ate some chocolate in bed too. Sue me! This conversation is not a rare occurrence in the Cortez household. You see, in case you haven't been paying attention, I'm a food freak. You name it, I want to eat it. And fast. Every meal, Steven has to remind me to slow down and taste your food woman! More often than not, I burn the crap out of my tongue because I just couldn't wait for something to cool down. I love all kinds of food but I especially love sugar. Banana cream pie, chocolate cake, ice cream, cookies, anything that's bad for me! I've always been this way so it's no wonder I have a love/hate relationship with my scale. With the new year right around the corner, I thought I'd share what has worked for me just in case anyone is looking for a new workout regimen. I have to preface this all by saying that I absolutely hate the gym, I loathe getting up from the couch and running makes me want to flick rubberbands at the treadmill. So, again, if these workout programs can get a lazy chick up, they're fabulous! Chalean Extreme - I started this workout in February of 2009 and by my wedding day (May 23, 2009) I had lost 20 pounds! I know right? So super crazy but it works! It's a 90 day plan filled with a variety of resistance exercises and minimal cardio. All you need is something to build resistance. I used resistance bands but light weights work too. I hate cardio and bouncing up and down and this workout was so doable. p90x - one word, intense. A combination of weight-lifting, plyometrics, yoga, kenpo and cardio makes up this set and it does get you in the best shape. Steven did this workout and all together lost a total of 60 pounds. If you have 1.5 hours available daily, a set of weights (5-25lbs. is average), a pull-up bar or resistance bands, and LOTS of will, do this. It was really hard for me but I do attribute this for keeping my weight off this long. 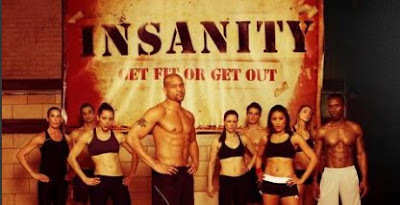 Insanity - this is our newest conquest. We started it about a week ago and it is very much properly named. The first dvd nearly killed us! But since then, I've learned to love it. It's a lot shorter than most dvd's but it's because you're moving the entire time. No joke. You don't need any equipment which is nice and once you're done, you feel like you're gonna die, which is what I always look for in a workout! The past few weeks have been strangely poignant for me. I've been all over the place and nowhere at the same time. And it's all been taking place in my head. Please don't think I'm crazy. Well, I am but, I like to think of it as a healthy crazy. You see, I've been trying to define myself. Really get to the core of me. Who I am. What I stand for. Where I come from. What's my look. What's my style. And it's been incredibly humbling. For a second there, I kinda got lost. I was thinking way too much about being the coolest, stylish, most awesome me that I was forgetting the best part. I was forgetting to actually be me. Last week, over wine, red velvet cupcakes and some amazing friends, I had a thought. This is the me I want to capture - the giggles, the honesty, the comfort, the unabashed interest in seeing through to another person's heart. I'd take a picture if I could but then you couldn't hear my childish laugh. You couldn't smell my color-extend shampoo. You couldn't feel my warm hugs. That is when I realized it. I can't possibly define me. I have to just BE me. And that's all I can ever do. What I'm trying to say is if you want to hear about my battles with chocolate, my obsession with old Roseanne episodes, and my high-school style romance with my husband, then stay tuned. All of this thinking is for something in the works that is super close to my heart. It's me. And I can't wait to share it. In the meantime, I want everyone to remember to be the best YOU you can be. It's all we've got! The room was quiet. Random bridal items were scattered around - a dress hanging here, some shoes laying there, the kids table crayons on the floor, nothing in any real order. The beautiful November light beamed through the window and there was Stephanie, gorgeous and calm, literally illuminating the room with her presence. It was as if she had done this before, it was as if she already knew the day would be perfect. As Stephanie spotted Jeff overlooking the ocean at the picturesque Terranea Resort for their first look, she squealed with excitement. She rushed toward him as if she was saving all her energy for this very moment. Jeff stood there waiting for his bride and as he turned around, they both emotionally embraced. It was as if they knew seeing each other before the ceremony would be the start to their perfect day. And it was. Click here for more of their fabulous wedding! Steph's mother was beaming as she watched her daughter dance around in her dress. Loved their connection. Stephanie is a knockout. Goodness Jeff, you are a lucky man! My favorite 2 shots of the day. I'm already thinking of places to hang them, in MY house, as canvases. Hope my husband doesn't mind! Floral Art was on hand for all of the stunning flowers.